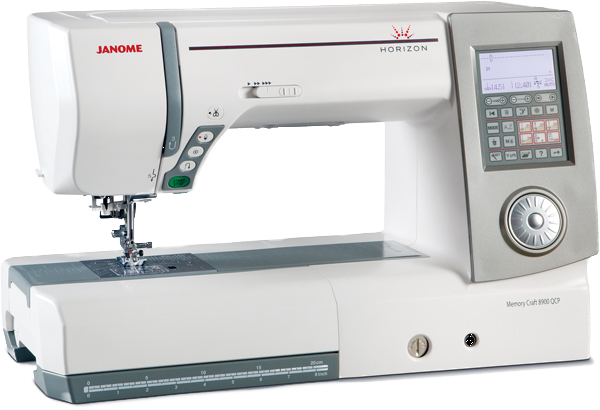 The New Janome Memory Craft Horizon 8900QCP is the Latest addition to our computerized Long arm range of Sewing Machines. We’ve taken all the best and easiest to use features from all our other models, added even more and packed them into one unbelievable machine! The sheer length of the arm space is impressive at 11″ ( 280mm ) .. ideal for large quilts, bridal dresses and those bigger home furnishing projects. And it’s powerful … reaching speeds of up to 1,000 stitches per minute. Nevertheless even at those speeds stitch quality is a priority. With a built-in AcuFeed system for precise fabric handling and 2nd needle plate to enhance straight stitch performance .. rest assured this machine offers spectacular stitch quality. Shadow free lighting is provided by 5 bright white lights whilst quick and easy stitch selection can be made on the large touch screen or with the jog dial. Choose from over 975 stitches including alphabets and numbers, including some great fun play stitches. Memorize a combination of these the Janome Memory Craft Horizon 8900QCP will calculate the length of the combined patterns just to make sure they fit into the available space on your fabric. Other special features include an automatic needle threader, speed controller to set your maximum sewing speed and stop / start button if you choose not to use the foot control. It also has a needle up / down button which programs the needle to either finish in the up position or in the fabric … great for pivoting on corners! It has a lock stitch button to ensure every stitch pattern is locked off at the end and even an automatic thread cutter to trim your threads.